The HC isn’t for decoration. This is a hockey club – a membership experience where fans and players can build a direct connection that is not possible in major league sports. Local kids have players reading to them at school or teaching them to skate one day and show up to a game the following night to see them on the ice and cheer from the stands as if they’re cheering for a friend. Members of the Railers family show up for the hockey, but stay for the companionship, atmosphere, Trax, and everything in between. Although the smaller size allows the relationship between the team and fans to flourish, being a minor league team presents its own unique struggles and resource limitations. The Railers know how vital community is to the club and recognizes the families that compose the Heart of the Commonwealth as the reason the organization is able to exist. Over 200 dedicated members of the Railers Booster Club go above and beyond to assist in charitable endeavors, and the internal staff at Railers HC is always hard at work. To show their gratitude, the Railers strive to foster the most mutually beneficial relationship between themselves and the people of Worcester and give back at every opportunity–just ask the Railers community relations coordinator Paul Harris. “Thanks to all the help from the locals and support from the Rucker family and the Worcester Railers HC Foundation, we are able to make a positive difference in the Greater Worcester Community,” said Harris. 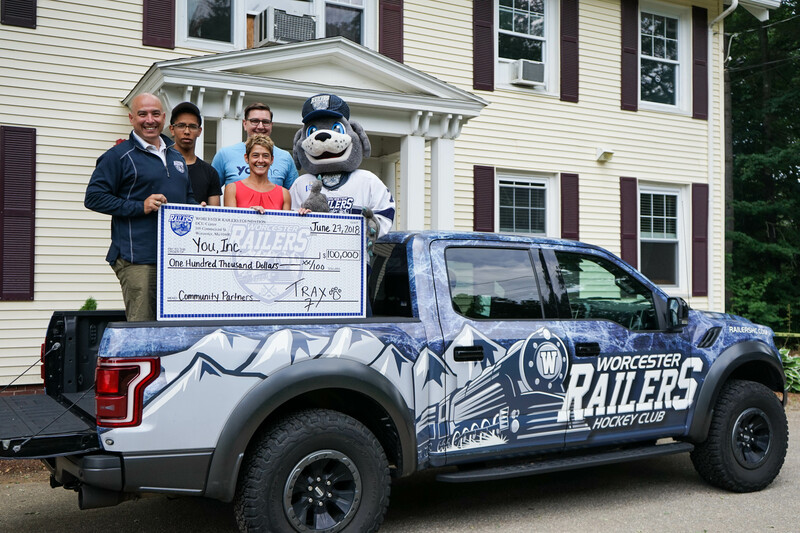 Doing everything possible to help Worcester’s community thrive has been the Railers passion since its inception in 2017. Now, in 2019, they hope to continue serving and entertaining the people of Worcester, expand existing programs, and break ground on new ways to make an impact. Trax, the only dog on earth that stands over six feet tall, can conduct trains and play hockey, is a key component to the Railers and has quickly become a beloved staple at every game in addition to hundreds of extra appearances around the Worcester area. 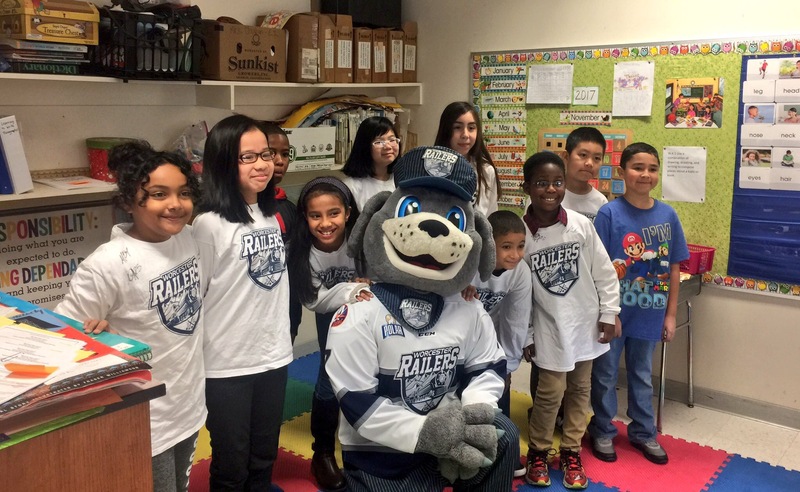 Trax can be found at all programs organized by the Railers community relations department, including Skate to Success, Ticket to Read, elementary school visits, and local hospital visits accompanying players. Skate to Success, a program entering its second year that provides local kids with a chance to lace up and experience a taste of hockey with the instruction of Railers players and volunteers, is flourishing now more than ever. Kids show up every Tuesday morning to the Fidelity Bank Worcester Ice Center, most nervous from having never skated before, and by the end of the session are, “Whipping around, buzzing like they’ve done it for years,” according to Harris. In addition to on-ice instruction, kids get Q&A time with a few players, receive help tying skates, and end the afternoon with huge slices of Nonna’s pizza on the house. There is a graduate program in the works to follow Skate to Success, a Learn to Skate for kids to capitalize and improve their new skating skills. Fifty previous participants from Skate to Success will get the chance to earn a scholarship from the Railers for this secondary program. This aligns with the Railers attitude that hockey is for everyone and inclusion is most important. The ultimate goal would be to someday give a child their first pair of skates and assist them on their hockey journey to make a home-grown Railer right here in Worcester. Ticket to Read is another way the Railers connect with the city’s youth. 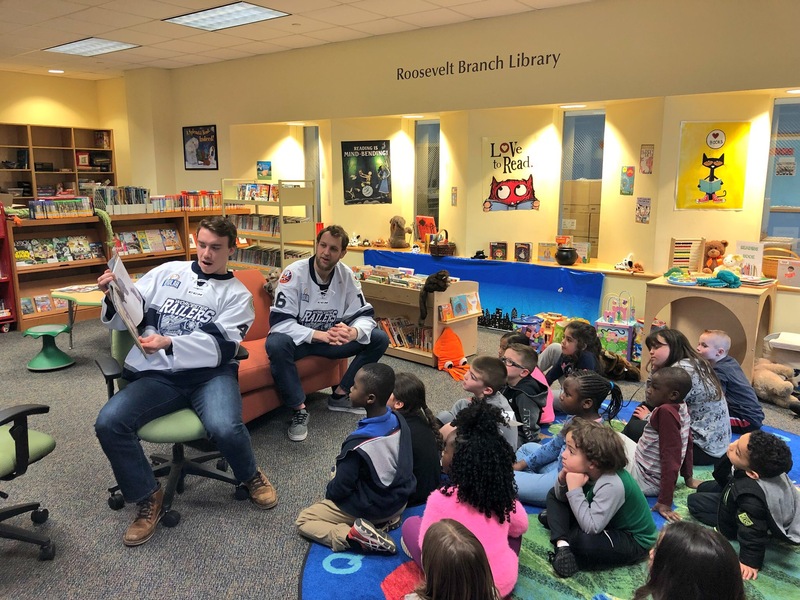 Railers players, along with players from the Worcester Bravehearts baseball team, circulate through different local elementary schools and read to kids in their own libraries. Those that read the most books win Railers tickets in hopes that kids will gain a new excitement for reading. This provides an environment for kids to really connect with the players while getting a fun spin on their school day and building strong habits at the same time. The Holiday season was a joyful time with over $40,000 donated to local organizations in addition to numerous other efforts to spread some holiday cheer around the Worcester area. Saturday, December 22nd was Non-Profit Awareness Night, where The Worcester Railers HC Foundation donated holiday checks to YOU Inc., The Boys & Girls Club of Worcester, PPAL, The Friendly House, the Nativity School of Worcester, Veterans Inc. and Rainbow Child Development Center of Worcester. In addition, $5,000 was donated to the Worcester Common Skating Oval and another $5,000 to the 80th annual Telegram Gazette Santa Fund. Two games’ worth of 50/50 Raffle proceeds and one Fill the Boot fundraiser with the Worcester Fire Department raised a total of $16,500, with all proceeds going toward the Ava Roy fund in the wake of the tragic passing of her father, firefighter Christopher Roy. 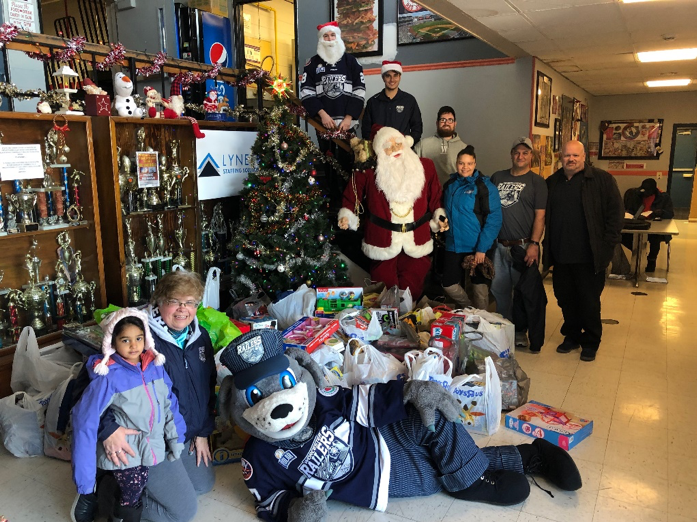 The Railers were thrilled to host hundreds of volunteers, directors, and family members affiliated with the above organizations at the home ice face-off against the Manchester Monarchs just two days before Christmas Eve. Representatives from each charity all threw in a hand for the puck drop to start the evening, and 50% of the night’s Chuck-A-Puck proceeds went to the Fresh Start Foundation, helping at-risk teens restart and get on the best track for a bright future. With all the donations received, no child within their organization went without a gift this year. Ms. Rowell explained that they will be putting an emphasis on their speech and language program in the upcoming year, helping bilingual children, providing extra assistance and expanding young vocabularies. Caring for kids as young as 8 weeks old all the way up to 13 years, Rainbow Childcare fosters long-lasting relationships with members throughout their entire childhood and even into their adult lives. The Railers hope to adopt this same tradition in connecting with young fans, Junior Railers, and their whole families. There was certainly no shortage of cheer in the months leading up to Non-Profit Awareness night. On December 14th, in the middle of a three-game home stretch for the Railers, Price Chopper 32 presented a canned food drive, with all contributions going to the Worcester County Food Bank. The following night, players wore special edition ugly sweater jerseys auctioned after the game to benefit the Shine Initiative presented by Fidelity Bank. The Shine Initiative is a non-profit that strives to raise public mental-health awareness and understanding in children and young adults. That same Saturday evening, the Railers had their first ever post-goal teddy bear toss, with all bears going to Worcester’s Friendly House in addition to $3,200 in toys from the Worcester Railers HC Booster Club. Contributing to the community that so generously supports the Railers is a year-round job. As much as the Railers love to play their part, they want to recognize the other prominent members of the Worcester community that go above and beyond for their neighbors. Conductors of the Community, presented by the Massachusetts Lottery, showcases individuals who make a difference locally. Another driving force in the community, the Mass Lottery returned over $997 million in net profit to the state just last year. As the final home games of the season rapidly approach, nominations will begin soon for the second annual Conductor of the Community. Last year, Tim Garvin, CEO of the United Way of Central Massachusetts was awarded the honor for all his contributions since taking leadership of United Way in 2006 and spending his whole career in the non-profit sector in addition to countless hours of volunteer work in around Worcester. During those final games at the DCU Center – January 19th, January 26th, February 9th, March 9th, March 16th, March 30th and April 6th– the Railers fans will showcase the extraordinary efforts of these individuals with an in-game presentation. Each recipient will receive four tickets to a Railers HC game and be invited to watch warm-ups from the Railers bench. What’s next for the Railers HC? Well, the wheels never stop spinning at the Railyard and new programs are already in the works. Right now, plans are coming together for Trax Fit, a program that will bring Trax and a few Railers to local elementary schools in Worcester county to take over their gym classes and show how fun getting active can be. Hockey incorporated elements and drills will be worked into the fun and games to bring a little touch of the Railers experience right to school. Additionally, after a few successful trips to the UMass Medical Center’s children’s wing, the Railers will regular visits to make patients stays a little more exciting. 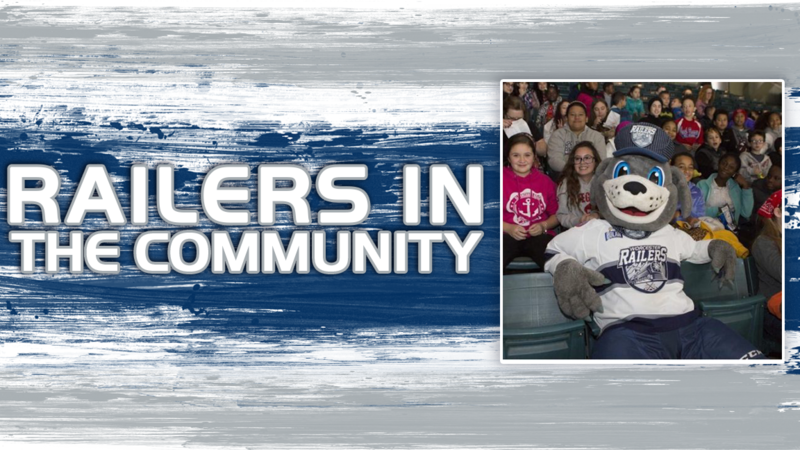 With two years under way and no signs of slowing down, the Railers HC looks forward to serving Worcester’s Community for years to come and delivering the best fan experience every time the Railers step onto home ice.